Epsom salts refer to a crystallized form of magnesium sulfate, a naturally occurring compound that has many health benefits. It's an over-the-counter product used as a home remedy bath for aches and pains. Epsom salts are also a natural laxative but its uses don't stop there. 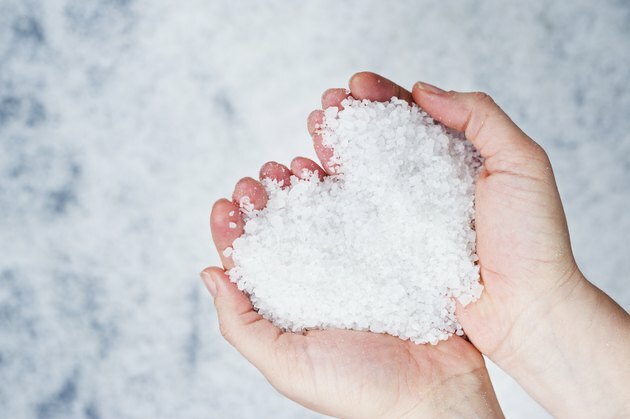 Epsom salts are used in asthma, diabetes and fibromyalgia therapies; and in improving functioning of the cardiovascular and nervous systems. Magnesium also improves serotonin binding, a mood-elevating brain chemical that creates positive feelings. In most cases if used as directed, Epsom salts pose no medical risk or harmful results. However, possible common side effects of using Epsom salts may occur when the substance is taken internally, be it orally or when taken as an enema. Used as a laxative, Epsom salts can produce several side effects: diarrhea and cramping; excess gas with bloating, nausea and excess thirst. According to Drugs.com, Epsom salts should be used as a laxative for no longer than one week. Overuse of laxatives may make your bowel functions dependent on them. Don't use too strong of a mixture or overuse the salts. Excessive Epsom salt intake may lead to magnesium overdose which is considered a medical emergency. Possible overdose symptoms of magnesium sulfate, according to Drugs.com, may consist of flushed skin, a drop in blood pressure and/or a slowed heartbeat. Other potential overdose signs can include nausea with vomiting, and reduced awareness or drowsiness. Ultimately, the most serious cases may result in coma or even death. Get emergency treatment if any of the above symptoms appear. People taking antibiotic medications--for example, demeclocycline, ciprofloxacin or nitrofurantoin--shouldn't take Epsom salts until cleared by a physician. The same is true for patients taking digoxin or digitalis, a cardiac medication. Finally, pregnant women should consult their obstetrician if they're considering taking Epsom salts. Although no evidence exists as to birth defects, it's a good health practice to check with a doctor first.